One of the most popular pieces in the park at the moment; ‘Ferryman’ is a bronze sculpture of high quality and detail by British artist David Goode. Goode’s works derive from his childhood fascination with folklore and myths. 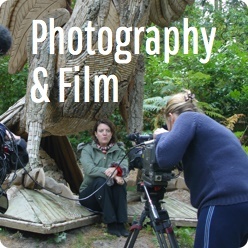 The fantasy based works which now form a vast collection referred to as ‘the goblin series’ consists of multiple goblin and fantasy based creatures all set in humourous situations or activities that provide a narrative and when in situe allows the work to communicate a great sense of fun that makes the work inviting for all ages and memorable. Goode chooses to work with bronze using the ‘lost wax’ method of casting as it allows for a highly detailed final outcome, which is important in his work to capture the character of the creatures and features that sets his work apart. 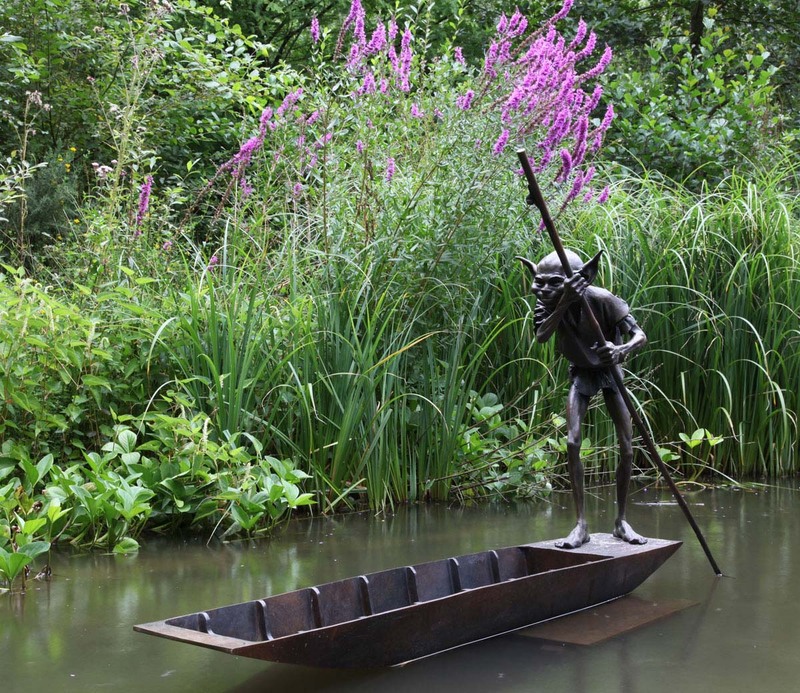 ‘Ferryman’ is a quirky piece that depicts a spindly legged goblin gently rowing a long empty boat across the water. With a long stick to push himself along he stands curiously atop the rear of the boat with a quizzical expression strewn across his cheeky face. The over dramatic ears with pointed tops give him the recognisable character of a goblin that we all grow up reading about. His enlarged feet anchor him to the boat, acting as a stabiliser that gives the work balance, along with the direction of the ore. Goode has created a character that although appearing to be witty and fun has a touch of the sinister about him, the emptiness of the boat and the questionably menacing look upon his face sees the work suggesting that he may not be friendly. Goode’s work is the embodiment of our childhood encounters with fantasy creatures, like goblins, his manner of applying details that make us relive our thoughts and feelings from our initial introductions to such things makes the work come to life in the imagination of all viewers. The work is highly accomplished in both the delivery of details and characteristics and of visual language which makes us reminisce as we do when we view his work. This entry was posted in and tagged Bronze Sculpture, David Goode on 5th April 2014 by Charlie.